Florida State overtook Baylor in a five-set showdown during the opening match of the 2016 Tallahassee Seminole Tournament on Thursday evening. The Seminoles took down the Bears 18-25, 25-15, 25-13, 19-25, 15-13. The Bears jumped out with a strong start in the first set, to take the set 25-18. The Seminoles took advantage of eight unforced errors by the Bears to open up the second set 12-5. Strong attacks from a handful of Seminoles lead to a 20-10 lead, which turned into a comfortable win for Florida State, 25-15. Again, Florida State came out strong in the third set, jumping to a 16-3 lead over the Bears. Baylor fought back, cutting the double digit lead to 19-13, but would stagnate and lose the set on a 6-0 run by the Seminoles. Baylor quickly jumped to an 8-3 lead behind three kills posted by Katie Staiger. The Seminoles fought back to within one, 16-15. The Bears ended their comeback with a 9-4 run closing out the fourth set and forcing a fifth. Both teams came to play in the fifth, battling through eight ties to reach 12-all late in the set. Three unforced-errors would end the match for the Bears 15-13. Florida State continues tournament play Friday with a pair of matches, Florida A&M at 1 pm and Little Rock at 7pm. Baylor faces Little Rock at 11am and Florida A&M at 7:30pm. TALLAHASSEE, Fla. – Florida State setter and Texas native Brianne Burkert enjoyed one of the best matches of her collegiate career, which included 35 assists, 11 digs and seven kills, as she led 13th-ranked Florida State to a five-set victory over Baylor by scores of 18-25, 25-15, 25-13, 19-25, 15-13 in the opening match of the Home2 Suites by Hilton-Tallahassee Seminole Tournament on Thursday evening. Burkert tied her career-high in assists as five of her Florida State teammates finished with at least eight kills, including Melanie Keil who posted a team-high 10. The others were Katie Horton, Mara Green and Milica Kubura, who contributed nine apiece, along Christina Ambrose who tallied eight kills. The Seminoles, who improved to 4-1 on the season, were also active on defense with 26 assisted blocks. Leading the way up front were Keil (nine assisted blocks), Kubura (six) and the tandem of Ambrose and Green who contributed four each. Freshman Madison Sullivan was the sparkplug on the back row with a team-high 12 digs, while the combination of Horton, Burkert and Cecilie Woie added 11. After a six-point Baylor (4-4) win in the fourth set knotted the match at two sets apiece, the two teams battled through eight ties to reach a 10-10 deadlock in the fifth frame. 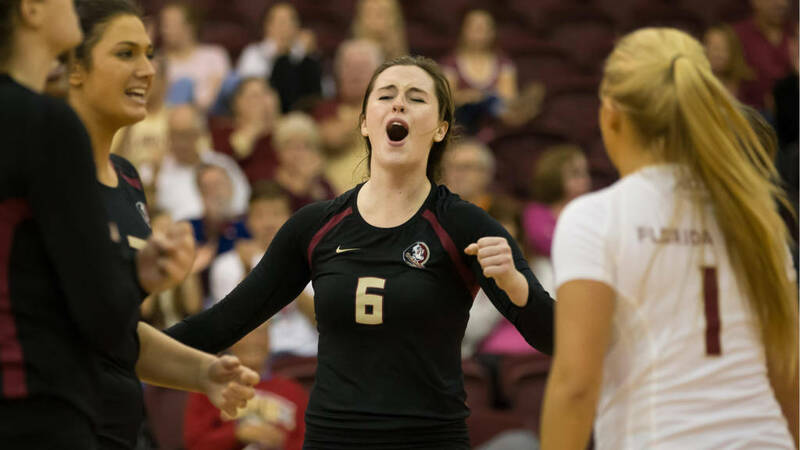 Burkert delivered a clutch service ace and Horton followed with a kill to give Florida State a two-point edge. The Bears answered with a kill from Ashley Fritcher and took advantage of a Seminole unforced error, bringing the set to a climatic 12-all tie. The momentum swung back in favor of Florida State with a pair of unforced errors by Baylor after a series of unforced errors. One late kill by Katie Staiger was not enough to deter the Seminoles who closed out their third five-set win of the season with an attack error by the Bears’ Aniah Philo. Facing a 2-1 deficit heading into the fourth set, Baylor regrouped in the opening stages of the frame and jumped out to an 8-3 lead behind three kills by Katie Staiger and service aces from the combination of Tara Wulf and Alex Banister. Two kills each by Green and Horton kept Florida State within striking distance as the Seminoles trailed 16-12 before spending their first timeout. Green and Burkert penetrated the Bear defense with a back-to-back kills and following a Kubura service ace the Seminoles were within one point, 16-15, as they forced a timeout. Baylor regained its composure during the breather and ended the set on a 9-4 run highlighted by two kills by Camryn Freiberg. Highlighted by four kills from Ambrose, Florida State assumed a 16-3 advantage in the early stages of the third set. Joining Ambrose among front row contributors during the offensive explosion for the Seminoles were Keil and Kubura, who had two kills and one service ace apiece. Baylor cut into the Seminoles’ double-digit lead with three kills by Staiger and two service points from Philo, as the two teams were separated by a 19-13 margin. At that point FSU’s senior duo of Keil, who contributed her third kill of the frame, and Horton, who was responsible for four service points down the stretch, closed the door on the Bears. Florida State capitalized on eight unforced errors by the Bears and used kills by Keil, Ambrose and Green to open up a 12-5 lead in the early stages of the second set. Leading by seven following the second Baylor timeout, the Seminoles quickly added to their lead with back-to-back kills by Burkert and Keil. Those strikes, along with three powerful kills from Kubura, extended the Florida State lead to 20-10, as the Noles knotted the match at 1-1 heading into the intermission. Staiger drove home three kills and Philo contributed a kill and a service ace to offset four unforced Baylor errors and pair of strikes by Keil as the Bears established a 14-8 lead early in the first set, resulting in the second of Florida State’s timeout. The Bears defense kept Florida State off-balance and in the process Baylor stretched its lead to 20-12 following an unforced Seminole error and a service ace by Staiger. The Noles made one final push, using a kill by Brianne Burkert and a pair of service points by Bozena Culo to move within 20-16, but Baylor score five of the final seven points to complete the win. Florida State returns to action in the Home2 Suites by Hilton-Tallahassee Seminole Tournament for a pair of matches on Friday to face Florida A&M (1 p.m.) and Little Rock (7 p.m.). TALLAHASSEE, Fla. – Baylor volleyball (4-4) pushed No. 13 Florida State (4-1) to the limit, falling to the Seminoles, 25-18, 15-25, 13-25, 25-19, 13-15.The Bears jumped to a strong start, leading wire-to-wire in the first frame to roll to a comfortable 25-18 set win. In sets two and three, the Seminoles took over, rolling to 25-15 and 25-13 marks to take a 2-1 match lead. In the fourth, BU closed on a 6-1 run to clinch the set and force the decisive fifth frame. In the fifth, neither squad was able to get ahead by more than a point, with the match tied at 8-8. Back-to-back FSU attack errors gave the Bears a 10-8 lead, but the Seminoles responded with a 4-0 run to go up by two at 12-10. BU clawed back, using a kill from Ashley Fritcher and a setting error on FSU to tie the match at 12-12. After the Bears lost a video review on a crucial service error call, the Seminoles took a two point lead with a block, forcing a double match point at 14-12. Katie Staiger came through with a kill to save the first, but another FSU block would end the match. • Katie Staiger notched her fourth double-double of the season and second-straight, leading with a match-high and career-high-tying 28 kills and 11 digs. • Morgan Reed finished with a match-high 41 assists. • Jana Brusek led both squads with 16 digs. 57 – the number of kills by Baylor hitters, outhitting the FSU side, 57-53. The Bears were forced into more attack errors (24-21), serving errors (12-4), and blocking errors (3-0).